Is a silicone intake right for you? Some skepticism is normal. Building an entire intake out of silicone has not been common practice in the past. However, now that Silicone Intake Systems is offering these high-quality products at the right prices, it is perfectly feasible. Let's examine some of the benefits that a silicone intake might have over traditional custom-bent and welded pipes. No more worrying about which intercoolers will work with which turbos in which cars. 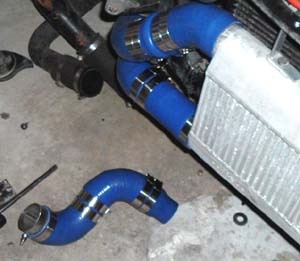 Now you can pick an intercooler that matches your setup perfectly - or one that you picked up for $10 from a junkyard. You can use any BOV. You can choose your intake piping diameter and color. These silicone intakes can be used pre-turbo, post-turbo, or post-intercooler, and can even be used to create a custom intake for a non-turbo car. A full 2.5" silicone intake, including all bends, hose clamps, and joiners, from the air filter to the turbo to the intercooler to the throttle body, should cost less than $300. This number will vary widely based on how many bends are in your particular setup. Even with manufactured, pre-bent piping, a great deal of running back and fourth to an exhaust shop/welder is often necessary. This is because every car has slight differences, even if stock. However, with a silicone intake, you have all the tools you need right in your own garage. 4. The parts you buy are re-usable. Custom bent or pre-bent pipes are a one-time purchase. They only fit one model of car (if they fit at all!) so if anything ever happens to the car, such as an accident, trade-up/trade-in, or even an intake reconfiguration, your investment is gone. With silicone, since the system is modular, you can re-use or re-sell any of the parts you buy. Did you just win the lottery and trade your turbo'ed CRX for a Skyline? Your custom intake will swap right over! 5. Similar or superior airflow characteristics. 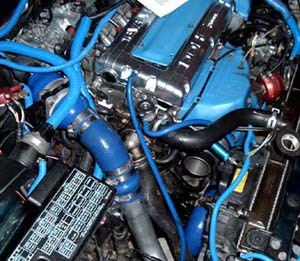 The typical street-driven, modified turbo car has the intake patched together out of a random variety of hoses, pipes, press bends, mandral bends, and couplers. The main problem with this approach is that the pieces are often made out of slightly different size pipe. Switching diameter in the intake should be done as little as possible because it creates intake turbulence, robbing you of horsepower. With a silicone intake, it is possible to maintain almost identical inner diameter throughout the entire system. Isn't it fun when you have to take your entire front bumper off because your intercooler piping is in the way of a bolt that you need access to? By using a silicone intake, you can take apart any part of it at any time, for any reason. Putting it back together is just as simple. 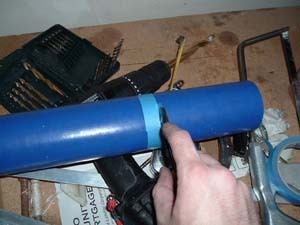 Compound bends are even easier than welding your own pipes - and unlike welding, adjustment is easy if you miscalculate. Depending on the alternative, switching to a silicone intake can provide a significant weight savings. This weight savings is also in your engine bay, where saving weight will move your center of gravity closer to the middle of the car. Assuming that your intercooler is performing well (or in the case of all non turbo cars), the intake charge should be cooler than the engine bay temperature. With metal piping, the air can actually absorb heat from your engine bay. Silicone has better heat resistance than metal and should provide a slightly cooler intake charge, providing more horsepower. A silicone intake will give your engine bay an aggressive, unique look. These setups get much more attention than any amount of chrome because you don't see them every day.